G'Day mates! Are you hungry? Do you have XTREME attitude and character? Well, it's time for you to get MADDDD!!! You know what I'm talking about? I'm talking about Mad Jack Cafe. 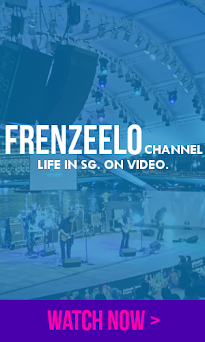 I'll be showing you the delicious food and desserts available here located in a heartland shopping mall also known as NEX in Serangoon, Singapore. 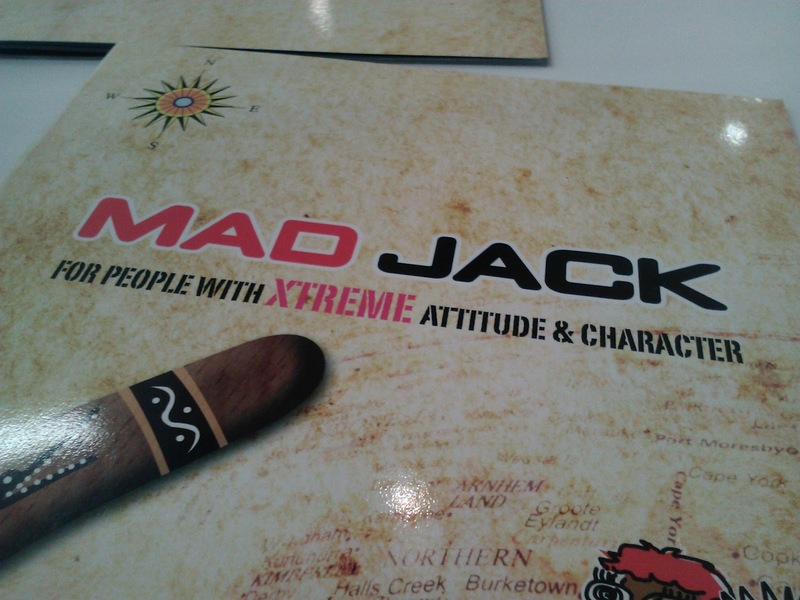 Mad Jack Cafe is a restaurant which serves up Western, Asian and Vegetarian food in an Australian theme. They serve mouth-watering food and desserts ready to unleash the inner Aussie in you. What's great about this restaurant is that you won't get charged the 10 per cent service charge. Almost every restaurant in Singapore will charge the Service Charge because waiters take your order and serve you. Think of it as a convenience fee. Whereas here at Mad Jack, you take the order chit, write down your order, present it to the counter, pay and wait for your food to be delivered to you. It's that easy. It may be slightly inconvenient, buy hey, you'll save money. After eating, you can just exit the restaurant since you have already paid for it in the beginning. 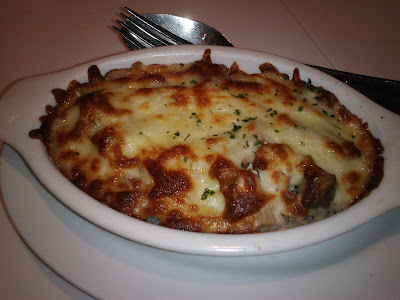 Read on further to check out their selection of delicious food that I got from the restaurant. Of course, I have to start with the side dishes first, am I right? 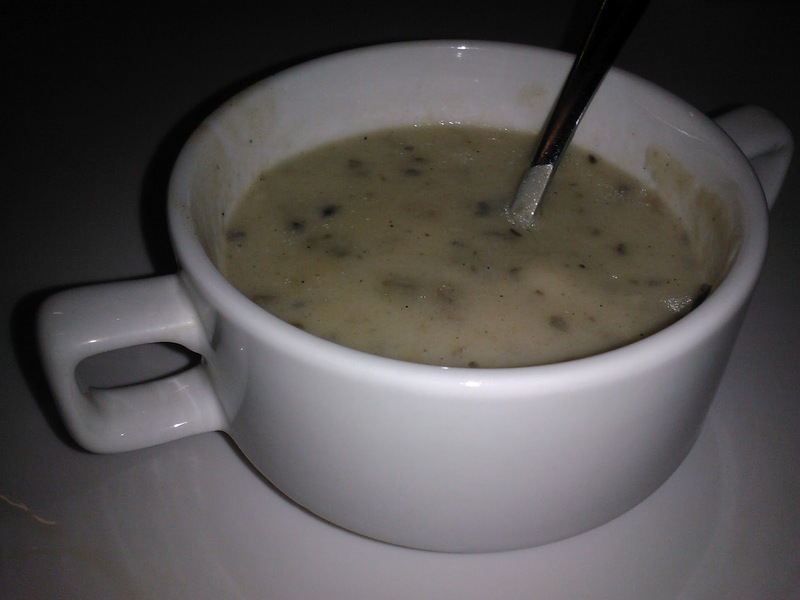 This is the Cream of Mushroom that comes with the Fish and Chips meal. It seems that almost every restaurant serves soup as part of their combos which is good because lots of people love soup and it's a great way to start before having your main course. The soup is typical like all mushroom soups should be and there were chunks of mushroom in the soup itself which was okay. I love mushrooms especially if they're on burgers. 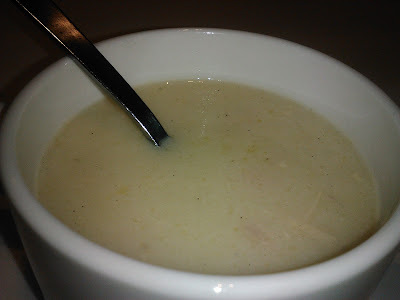 Another soup worth mentioning is the Cream of Chicken. Again, it's typical soup just like what you can find at other restaurants. Nothing really special about it and there were tiny pieces of chicken in it which was what I dislike. The taste was very salty and it's like drinking saltwater with tiny pieces of chicken in it. Hopefully when you order a combo with your main course, you get the Cream of Mushroom instead of this. Still, if you want good value for money with your main courses, I think it's worth topping up a few more dollars to get the Soup of the Day, a Pepsi and a small dessert even if the soup is different. Look at that monstrosity. One of the tallest burgers I have ever eaten in my whole life. This burger's called the Blue Mountains Beef Burger which is a burger with three (yes THREE) beef patties, slices of cheese, tomato sauce, pineapple and lettuce. 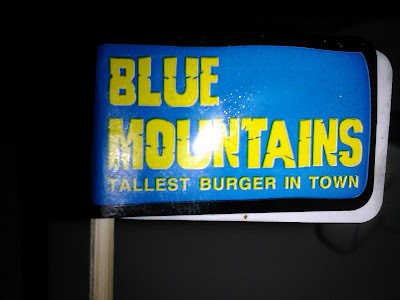 If you love meat like me, the Blue Mountains Burger is definitely the burger to get over here. 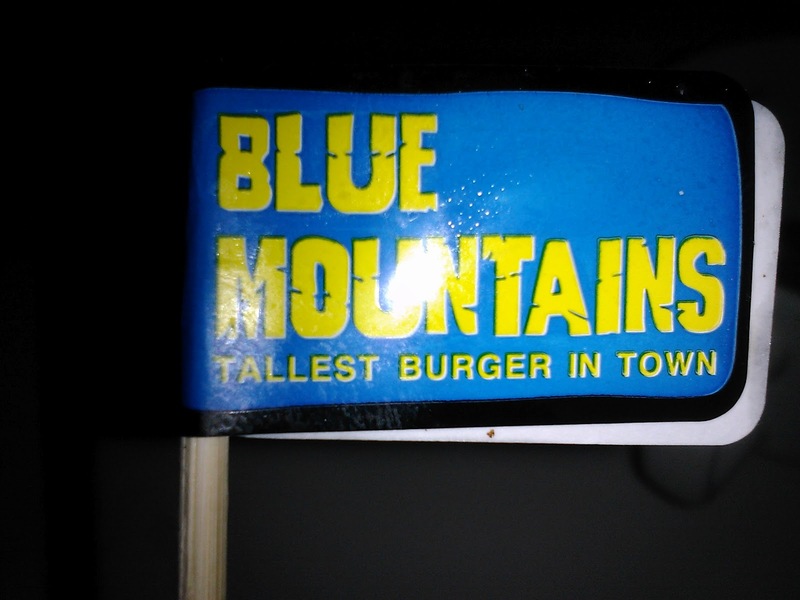 If you're really up for the challenge, then get yourself the Extreme Blue Mountains Burger which has a whopping FIVE patties and more slices of cheese. Chicken version is also available. The burger was alright. Doesn't taste like a typical fast food burger and the meat was slightly thicker than those you find in a fast food restaurant. The burger's so tall that I had to take out the flag (pictured above) and take out two meat patties and the pineapple. What was left was just one patty and the rest of the burger. After slowly savouring the burger, the rest of the two meat patties were shared among my mum and my sister so that I won't feel guilty eating so much meat and consuming too much calories. The burger patties weren't that juicy and wide as I expected but it was thick enough for my liking. Now it's time for drinks. I got two drinks, the one shown above was the Ice Latte and the other one was the Milo Dinosaur. 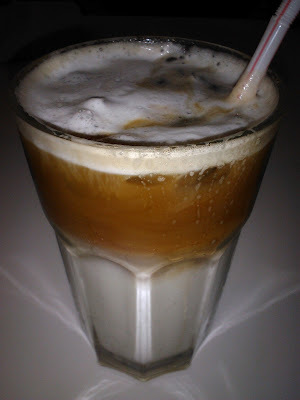 The Ice Latte looks delicious but I can't really say the same for the taste itself. I'm not so sure if I'm drinking it the correct way since I'm mostly a tea drinker but I stirred the drink and when I took a sip, it was quite bitter. Coffee lovers, can you tell me if I'm drinking it the correct way? Do I need to put sugar in it? Or is it really supposed to be that bitter? I need to know the answers. The drink was a great drink and it really quenched my thirst. This one's for the coffee drinkers out there. 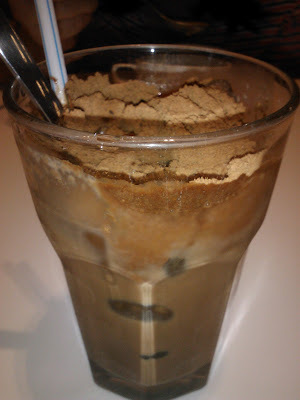 This drink is the Milo Dinosaur. If you don't know, Milo Dinosaur is a popular chocolate malt drink that has a thick Milo base and heaps of Milo powder at the top of it. It's like heaven for chocolate and Milo lovers out there. Most of the time, Milo Dinosaur is served at most Indian Muslim coffee shops that usually sell dishes like Roti Prata and Mi Goreng. However, the one at Mad Jack is slightly more expensive and isn't really that much different from those you can find at the mentioned coffee shops. However, if you really cannot stop craving for Milo Dinosaur and you happen to be at Mad Jack, I suggest to get this to satisfy your craving. Other soft drinks and even Mineral Water are available at Mad Jack along with a range of hot drinks and freshly made juices. Sorry if the picture looks too messy for you. I can't think of a better angle. This dish is known as the Grilled Chicken In Cream Sauce. It's essentially a piece of grilled chicken smothered with cream sauce on top and a generous serving of fries. The thing about Mad Jack's main courses that come with fries is that their fries are mixed. Some of the fries will be those typical thick cut fries you can get at almost everywhere while some are spicy fries. I believe the spicy fries that they serve are Cajun spiced because they tasted a lot like Popeye's fries. It isn't that spicy but has a very nice taste and crunch to it. 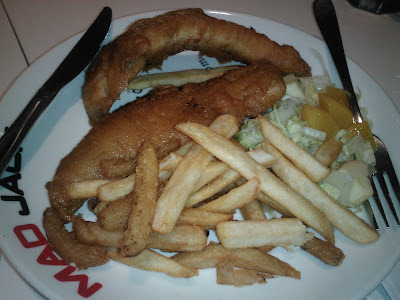 Apart from the fries, the Grilled Chicken is also served with apple peach salad which is the result of the messy looking salad found at the bottom of the picture. I like their grilled chicken simply because it's tender, juicy and cooked very well. What I particularly don't like is the cream sauce that has been poured around the chicken. 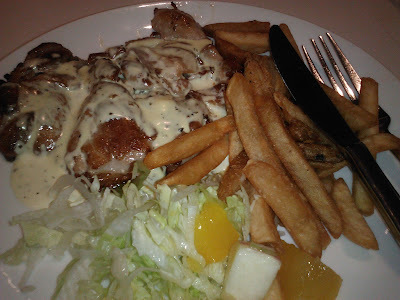 The cream sauce was totally horrible and didn't complement the chicken well. Plus, it makes the dish totally unappetising. It doesn't really have that much flavour. What you should do is maybe get the one with Black Pepper sauce or BBQ sauce which I think will taste better. Still, I do appreciate the grilled chicken. You don't have to feel guilty because it's grilled instead of fried. Try to get it without sauce to cut down some more calories. Now it's time for dessert. I have to admit that Swensen's has some of the best restaurant desserts because they have a wide variety of ice cream sundaes and ice cream cakes. 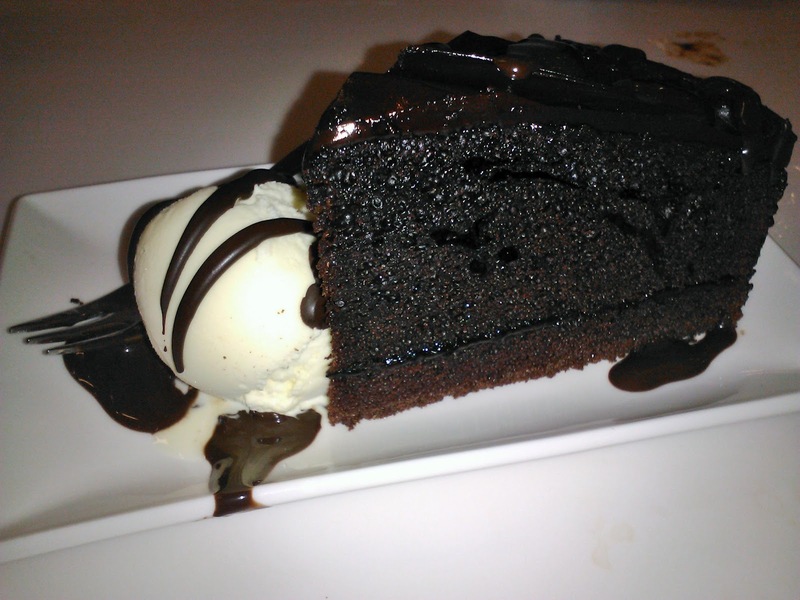 Mad Jack's desserts are not as vast as Swensen's but they still make delicious and mouth-watering cakes and desserts. Plus, they even have a fridge showcasing their desserts facing passers by. The picture that's right above is the Mad and Rich Chocolate Cake with Vanilla Ice Cream and Chocolate topping. It's actually their most popular dessert. In fact, it's so popular that it took a long time for mine to arrive at my table because everyone's ordering the same dessert. I really love this cake because it has a unique shape and it's very very chocolatey. The chocolate above the cake was moist and sweet and the cake itself was moist and melted in my mouth. It was simply heavenly. 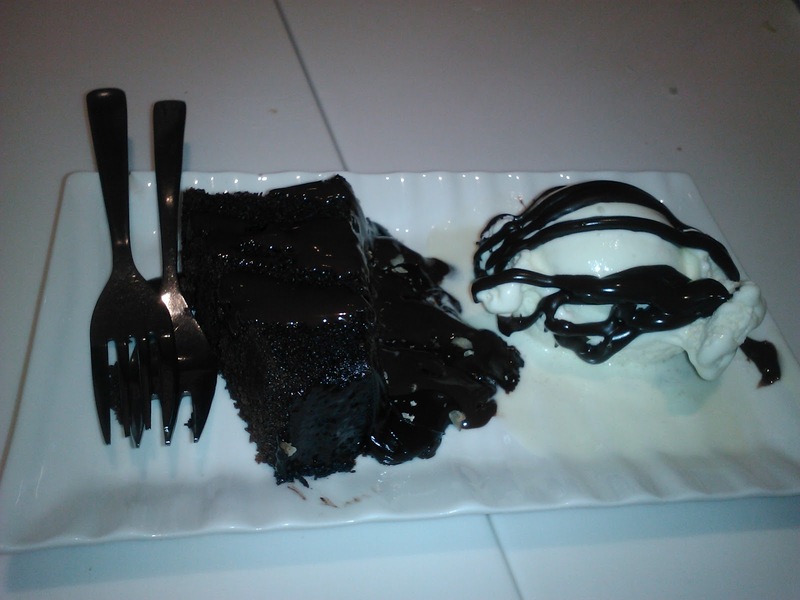 The chocolate drizzle and the ice cream were great complements to the dessert. 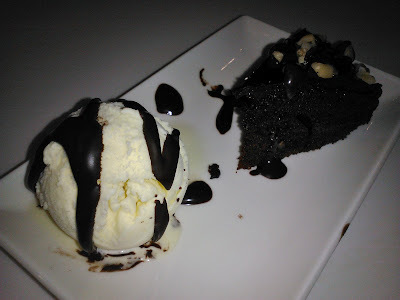 This is the OZ Brownie with Ice Cream. I don't know what OZ stands for but the brownie was a bit harder than usual brownies but I like the sweetness of it. However, the sweetness was a bit overpowering and those of you health conscious people should totally get away from this dessert. The ice cream made the Brownie a little more sweeter and more moist. The last dessert I'll talk about will be the Oreo Cheesecake. Okay, I know it's possible to get Oreo cheesecake from almost everywhere. 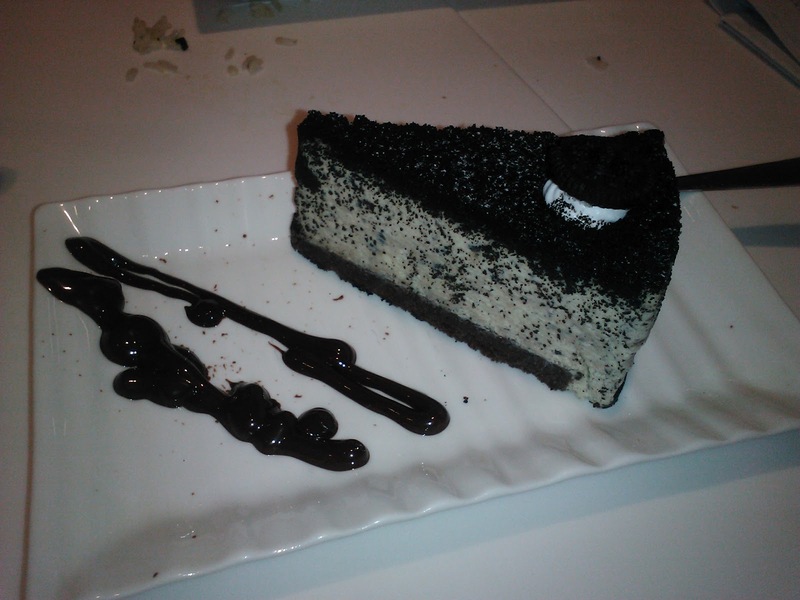 The Mad Jack was the typical Oreo Cheesecake and has that typical taste that's no different from others. I like the small mini Oreo on top and the chocolate drizzle beside the plate. If you love cheesecake, you can either get the Oreo cheesecake or the Lemon cheesecake. Oddly enough, there's no regular cheesecake on sale here at Mad Jack. Some of the desserts, especially those that are on display at the fridge, are also available for takeaway. 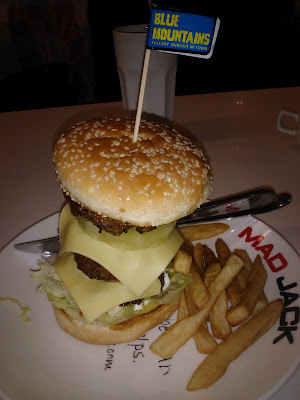 Overall, my visits to Mad Jack cafe were great. You don't have to pay the service charge, the servers were friendly, there's a huge range of desserts, main courses and so much more. Also, Mad Jack cafe's interior is filled with lots of humorous phrases and references to Australia. If you look closely on the plate of your main course, you'll find a witty message but only after you have finished your main course. The food's not that cheap but hey, you're paying good money for good and delicious food. There's also delivery but it will depend on where you stay. Mad Jack Cafe is also available at other places such as Jalan Kayu and Pasir Ris.